Worried your tee shot might skip out-of-bounds, land in a bunker, or plop into a water hazard? Want to impress your golfing buddies? 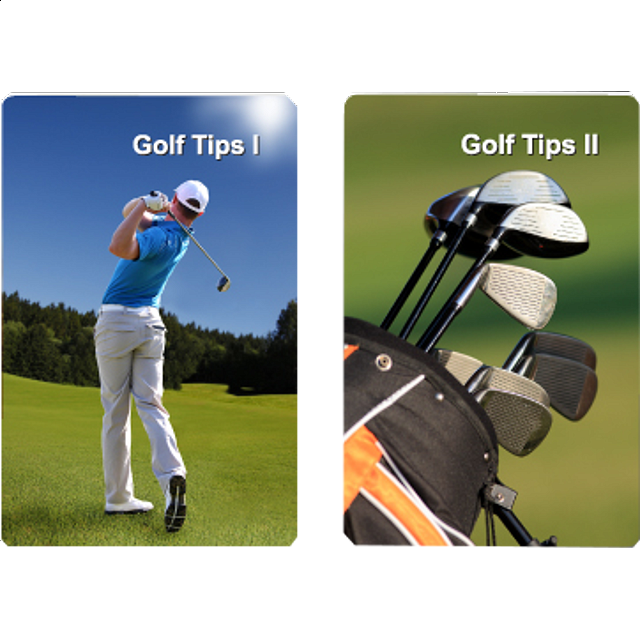 Look no further than our Golf Tips Playing Cards to improve your game. So you're staring at a deep lip on a sand bunker... what to do? You have to get good loft. Just as you would with an uphill lie, make sure your body is aligned parallel with the slope so that you can swing along the slope and not into it. Your shoulders and hips should run parallel with the uphill slope of the sand. To do this, lower your right shoulder to get them your shoulders even with the slope. Your angle of attack will be shallow, allowing you to catch the ball on the upswing to loft if out of the trap. If your shoulders and hips are aligned down, your swing plane and angle of attack will be too steep and your clubface will hood down. The resulting low trajectory of the ball will cause it to come back to you. A low golf score starts with perfecting your swing. For right-handed golfers, as you take your club back, keep your left arm parallel to the ground. This will help you extend both arms during your backswing which is critical to setting them in the right position to create accurate speed in your downswing. If your arm is not parallel, you're already disconnecting it from your body very early in your swing. From the top, keep your left arm as straight as possible while aggressively bending your right elbow to add power to the clubhead. Extend both arms as you swing through the ball, transferring the energy in your right elbow to the ball as you straighten both arms. The longer your arms remain straight, the better. A great gift idea for the avid golfer; pick up our Golf Tip Playing Cards today and see an improvement in your golf game! Interested in Golf? Check out our Golf Trivia Playing Cards featuring 54 Golf Trivia and 54 Golf History playing cards.